The past couple of months have been busy ones. It is normal for me to drop off the radar during the holidays, just to have enough energy to give work all I have. Eat, sleep, and then do it all over again the following day. Once the rush passes, I resurface and life resumes at a more even pace. Amidst all the hustle-and-bustle, there have been changes and exciting new endeavors. One in particular that I am excited to share, is a feature editorial piece that I wrote and photographed for Edible Kansas City. 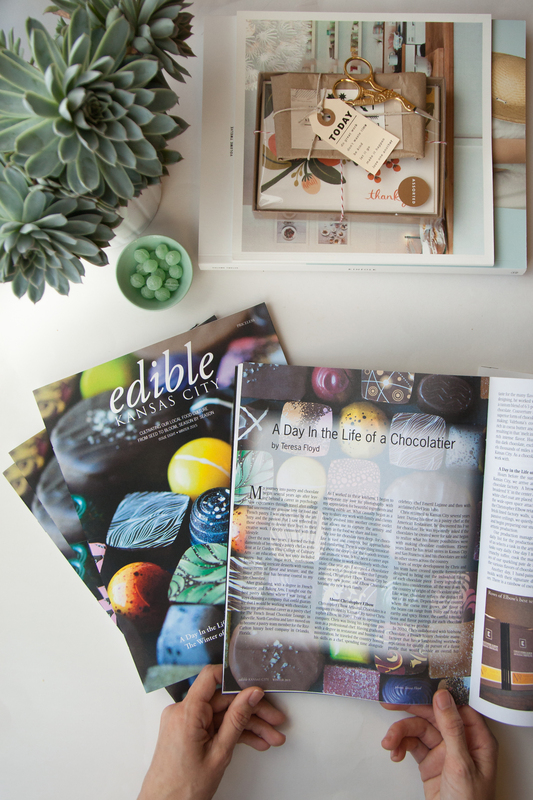 In this winter issue, I share about how my professional pastry career began, how my food photography has become a factor in my work, and my work-life with Christopher Elbow Chocolates. What is means to be a professional chocolatier and how we create the beautiful tiny masterpieces of chocolate bon bons day after day. I confess that sharing my journey was more emotionally difficult that I expected. It was a deeply personal topic, as it was about my life and about a group of people that are near to my heart. In the end, it was rewarding and an honor to share. 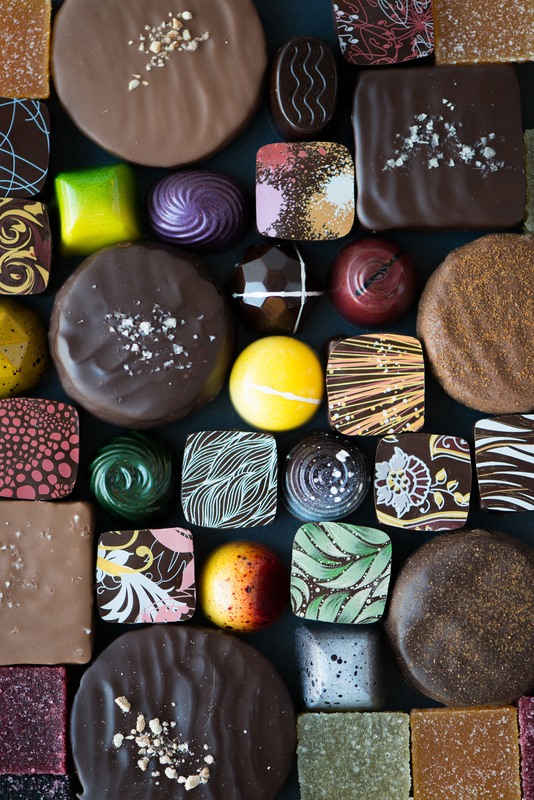 One of the greatest joys, was the opportunity to photograph the chocolates and confections that are made at Elbow. Photography has long been a passion of mine, particularly food photography, and capturing the beauty of the pieces that were made by all of us was very special. A new future is beginning to unfold for me. As I continue to follow this path, Now, Forager will continue to be where I go to stay connected and share what I am currently creating. If you choose to read the words and view the photos I have shared in Edible, it is best to enjoy it with something chocolatey nearby. Allow me to share one of my favorite cookie recipes. Sables Korovas. Sables are delicate French butter cookies. 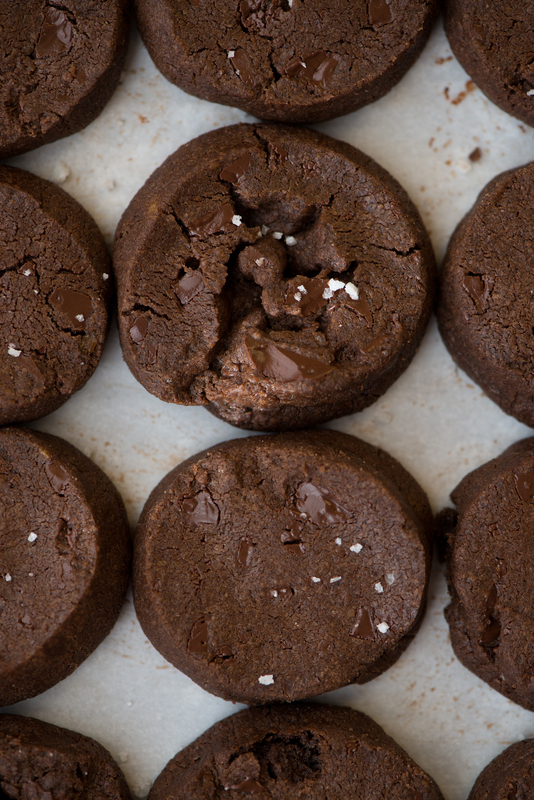 These Korovas, originally created by Pierre Herme and shared by Dorie Greenspan, are deeply rich chocolate cookies. They have crunchy edges and tender-chewy centers, with little bits of melted chocolate sprinkled throughout. Sit with a cup of your favorite beverage and nibble away as you read. I hope you enjoy both the editorial and the cookies. Sift together all purpose flour, cocoa powder, and baking soda. In the bowl of a stand mixer, with a paddle attachment and at medium speed, beat your butter until creamy and soft. Add both sugars, fleur de sel, and vanilla extract. Combine for two more minutes, stopping to scrape the sides and bottom of the bowl half way through. Add your flour mixture to the bowl. At your lowest speed, mix in the flour just until the flour disappears and is combined into the dough. Your dough will look crumbly and sandy. Add your chocolate and mix on low, just until combined. It is important to not over-mix the dough or it will make the cookies tough and not tender. Place the dough onto a work surface. Gather and press it together with your hands. Divide the dough in half. Shape each half into 1″ diameter logs (by rolling it “back and forth” under your palms evenly). Wrap each log in plastic wrap and place in the freezer overnight or until frozen through completely. You may also refrigerate the wrapped logs for at least 3 hours, up to 3 days, or freeze for up to 2 months. Preheat your oven to 325F (160C). Remove a chocolate log from the freezer and allow to sit out at room temperature for five minutes (this will make cutting the dough easier). Using a sharp knife, carefully slice dough into 1/2″ thick rounds. Place rounds on a parchment or Silpat lined baking sheet, about one inch apart. If the dough crumbles and breaks, simply press it back together. Bake the sables for 13 minutes (12 minutes if you are pulling them from the refrigerator). When you remove them from the oven they will not look done and not be firm, but they will firm up as they cool. Place them on a cooling rack and allow them to cool to completely. Store sables in airtight container for up to three days. Recipe adapted from Paris Sweets, by Dorie Greenspan. I can’t wait till i have my own place to try all these out! 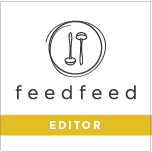 Your writing style is as elegant as your recipes and photos. Beautifully captured, pristine works of art. Thank you for your toil and editorial!!! Thank you for such kind words! I truly appreciate them and am grateful that you enjoy what I share here. It is my pleasure. I made these and they turned out incredible. One of the best tasting cookies I’ve ever had. Mine flattened out a bit more and I’m not sure why. Do you have any tips to keep them from spreading out? Hi Erol! Happy to know that you enjoyed them. To minimize spreading, your best bet is to store the dough in the freezer. When ready to bake just pull the frozen log from the freezer, cut, and bake right away. Hope this helps! Thank you! I’ll make sure they’re super cold. Would the temperature of the oven make a difference? Mine is a bit old, so it’s usually anywhere form 0-25 degrees in variability. Yeah, the oven temperature definitely needs to be at the 325F mark. I’ve had to deal with oven variability before as well, so storing an oven thermometer in your oven will help you adjust it to the right temperature. A very cold dough and the right oven temperature should give you those nice raised-cut edges. If not, then double check your scaling and the ingredients that you use on the next batch (ingredient measurements and the type of butter that you use- i.e. use real butter not margarine, etc.). Thank you for all the help! I want to get it just right so I’ll definitely pay attention to that thermometer. I used the Plugra butter, and my is it good! This is a recipe I can see myself making every week.